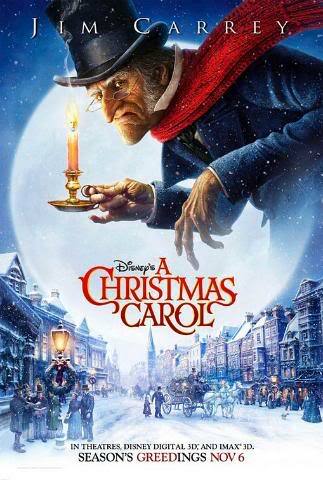 The defining thing about this new version of A Christmas Carol is the animation and the 3D. The visuals are stunning. The look and feel of London, the character designs, the ghosts, especially the way the ghost of Christmas future was presented, in a Salvador Dali-esque type of way, was impressive. Add to that a great score of Christmas classics, and the atmosphere was equally impressive. Acting wise, the acting animation and the voice performances were great as well, with Jim Carrey voicing several characters while at the same time giving them different personalities. The thing that bogged down the animation was its physical scenes and its flare. Motion/ Performance capture might work well in acting scenes, but when you have a lot of physicality, like falling down or flying through the air, many times real-life needs to be adjusted. Lastly, the 3D, while it is nice that many movies are moving into this trend to immerse the viewer more into the world, sometimes I think its just unnecessary. A Christmas Carol works best in simplicity. The downside of dressing something up so much is that you lose the impact it originally had. Since I’m studying in the animation field, there is tendency to make things more flashy, and for certain things to make them more “real.” I know many of the animated Robert Zemeckis flicks attempt this same thing. Sometimes you have to remember, even though it looks real, it doesn’t mean it feels real.